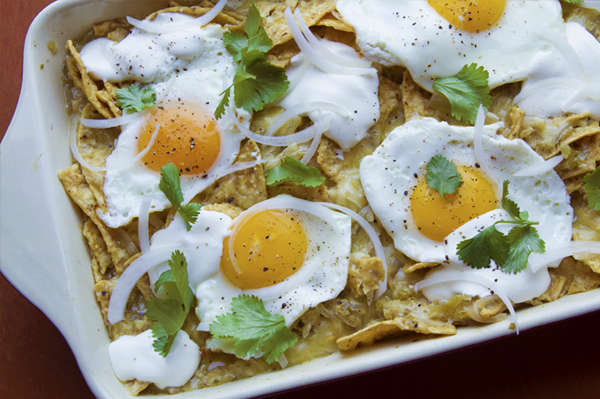 OK, so it’s not the most traditional Easter brunch dish, but the benefits of cooking these chilaquiles are two-fold — one, this relatively simple recipe feeds a big crowd, and two, they’re absolutely delicious. Instead of a simmering stint on the stovetop, these chilaquiles are finished in a baking dish with a 10-minute stay in a hot oven, allowing the tortilla chips, melting cheese, sauteed onion, roasted tomatillo salsa and chicken stock a little extra time to meld together. Pair it all with a big side salad — here’s a simple, great dressing — and you have a meal suitable for your Sunday best. Preheat your oven to 300 degrees. In a large (4-quart) pot, heat the oil over medium-high. Add about 2/3 of the onion and cook, stirring regularly, until richly browned, 8 to 10 minutes. Add the salsa and broth and bring to a rolling boil. Turn off the heat and stir in 2/3 of the shredded cheese. Pour the chips into a 13x9 inch baking dish and cover with the sauce, gently pressing the chips into the sauce, breaking up larger pieces, so that all of the chips are coated. Sprinkle with the remaining 1/3 of the shredded cheese. Cover the baking dish with foil, being careful not to let the top of the chips touch the foil. Slide into the hot oven to heat through, 8 to 10 minutes. When the chilaquiles are bubbling, remove from the oven, drizzle with the crema and sprinkle with the remaining onion. Top with the queso aňejo and cilantro, and the optional sunny side up eggs. Serve without hesitation. Spread out all the ingredients on a rimmed baking sheet and slide it as close up under a preheated broiler as possible. After 4 or 5 minutes, when everything is blotchy-black and softening, turn the vegetables and roast the other side. They will be finished when everything has cooked through (they should be soft) and have an attractive bit of rustic char. Cool, then slip the skins off the garlic and pull the stem off the chiles. In a blender or food processor, combine the tomatillos (and any juice on the baking sheet), garlic, chiles, onion and a scant teaspoon salt, and process to a coarse puree.